Chewable elemental calcium from a highly absorbable natural calcium complex including carbonate, citrate, fumarate, malate, succinate and glutamate. Sweetened with fructose and sorbitol. 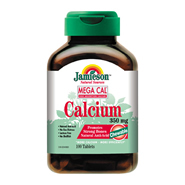 Each tablet contains: Elemental Calcium 350mg.